Apache MFS65n, Aldila NV2, Phoenixx ThermoReactor, Graphite Design, Harrison, and Penley. Try the Alpha V2 with the new MFS Deep from Apache, Accuflex Assassin, Harrison, or Penley Longdrive shafts. Email for a quote and for help choosing the right shaft and flex. Prices start at $325 with the Apache MFS65n, Graphite Design YS6, or AJ Tech ZTour55 or ZTour75. $350 with the hot new AJ Tech "Raw Gold" TSP. Joe Raimonda won the Boys Junior A division using Alpha Golf drivers. Raimonda wowed the crowd with a 351 yard bomb that brought the fans to their feet. competitors are calling "the hottest driver in golf". November 8th. We are really excited by the reaction to our products." weeks and try to bring Alpha Golf another title!" 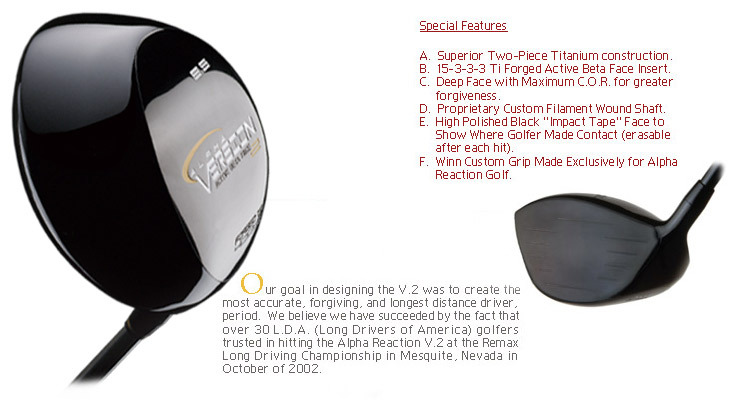 win the senior division of the 2003 ReMax World Long Drive Championship. Alpha Golf Earns Another Victory at SMT/ACCUFLEX Long Drive Challenge. Alpha Golf enjoys first and second place finishes at SMT and Accuflex sponsored event. CHATSWORTH, CA, November 3, 2003-- Alpha Golf drivers were used to earn first and second place finishes at the SMT/ACCUFLEX Challenge at the Plantation Park in Byron, Georgia. Kevin Bullard of Georgia won the challenge, while David Mobley of North Carolina finished second. Both athletes were using the Alpha C830.2 460cc Titanium driver. The first and second place finishes marked a decidedly key victory for Alpha golf and its high performance C830.2 driver. The new driver for 2004 has debuted with great success and has caught a full head of steam. The SMT/ACCUFLEX sponsored event featured forty-eight athletes. Kevin and David were both driving past the 380 yard mark and even extending past the end boundary, literally in the cotton fields of the plantation where it was held. The C830.2 with the new and improved Increased Target Design (ITD) technology will be widely released early 2004. Copyright 2002 Kent Sports, Inc. All rights reserved.